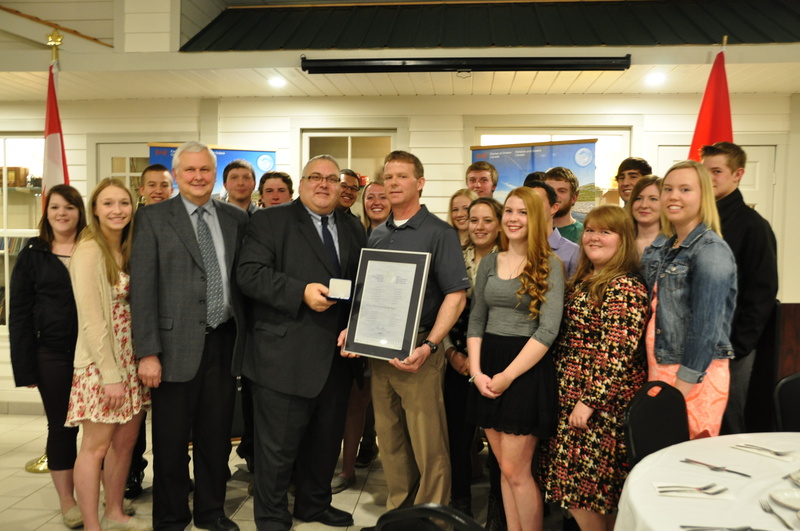 On April 16, 2015, East Elgin Secondary School's Environmental Leadership Program was presented with a 2015 National Recreational Fisheries Award by Joe Preston, Member of Parliament for Elgin-Middlesex-London, on behalf of the Honourable Gail Shea, Minister of Fisheries and Oceans. Under the direction of teacher Duncan Sinclair, Jr., the Environmental Leadership Program takes in more than 20 students per year to work on improving habitat in the Catfish Creek watershed. For more than 12 years, numerous students have taken a hands-on approach, outside of school hours, to enhance their region's forests and fisheries, curb erosion, build stream banks and educate other students from local schools. By providing youth with hands-on activities that foster an early understanding of the importance of the natural environment, the Environmental Leadership Program is helping to develop a new generation of informed and committed stewards. In fact, some students have gone on to pursue conservation careers. Recreational fisheries have tremendous social and economic importance to Ontario and indeed, to all of Canada. That is why our Government is committed to supporting the individuals and organizations who are working along the shores of Canadian lakes, rivers and streams to protect and restore fishing habitat for future generations. The Government of Canada is proud to recognize the hard work of the members of the Environmental Leadership Program. Canada's National Recreational Fisheries Awards were created in 1989 to recognize outstanding contributions by individuals and organizations in areas such as recreational community leadership, restoring and enhancing fisheries and fish habitat or promoting conservation and sustainable recreational fishing. Recreational fishing represents an important economic, social and cultural contribution to Canada. According to the most recent survey on the topic, recreational fishing in the country contributes approximately $8.3 billion to local economies from coast to coast to coast. The Government of Canada has committed $25 million to restore and preserve fishery habitat through the Recreational Fisheries Conservation Partnerships Program. "The Government of Canada recognizes the importance of recreational fisheries and the importance to protect it and we all have a role to play. 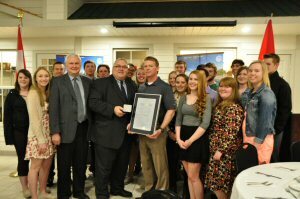 Therefore, I congratulate Mr. Sinclair and the East Elgin teachers and students for educating others about the importance of this work and getting future generations excited about environmental stewardship." "Environmental Leadership Program students believe that preserving, restoring or enhancing fish habitat is key to fisheries management. Through activities in the Catfish Creek watershed, my students now understand the value of fish habitat. And the more opportunities that we can provide them, the greater chance we have at stimulating their interest and creating their passion. I'd like to thank the staff at the Catfish Creek Conservation Authority for their years of involvement and dedication." "The Catfish Creek Conservation Authority and the communities within its watershed have benefited greatly from the partnership with the East Elgin Secondary School's Environmental Leadership Program. Being able to support environmental education in the classroom with hands-on experience in the field is something very special and unique for the students to experience. It was a pleasure to nominate the Environmental Leadership Program for a National Recreational Fisheries Award."